Manhattan — one of the most iconic boroughs and areas within New York. Whether you're envisioning an acred park or a tree-lined neighborhood tucked away in the city, you'll always take note of the elegant designs and beautiful scenes marked by trees, flowers and shrubbery. So how do you get there with your own Manhattan property? Dragonetti Brothers Landscaping is the solution that can make your landscaping dreams a reality. Whether you're looking for a redesign of your front lawn, a new garden design out back or some simple tree service to maintain your company's building, we have you covered. With a wide variety of services provided, our team of insured and licensed professionals will meet your vision of transforming your property. Every landscaping project our team takes part in consists of four significant steps: consultation and design, site preparation, installation and maintenance. Consultation and design is a crucial step because it allows our team to get to know you, your area and your vision. Landscaping should reflect you or your business — you wouldn't want to mislead your customers because the trees around your entrance looked uninviting. Our discussion with you will allow our team to brainstorm and create three-dimensional renderings that you can easily visualize on paper before they become a reality. Site preparation is an essential step too, as it smooths the base for your new design. Clean and clear are the looks we're going for. Not only do we make sure we begin with a fresh site as we start our work, but we also clean up afterward to keep your area looking pristine. In some areas, we'll even provide rough grading — a way for us to create the perfect slope for a natural drainage system. Our team provides two types of installation — hardscape and softscape. Hardscape installation is more industrial and constructional, including items such as patios, walkways and walls. Many of these features can be incorporated in your garden design to stand out in Manhattan. To complete the look of your garden, we'll begin softscape installation, adding plants, shrubbery, trees and flowers to your design. Finally, maintenance is upheld for many properties. 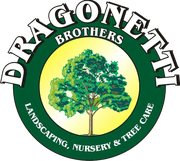 Regular fine-tuning of lawn care, tree services and mulching are provided and efficiently performed by Dragonetti Brothers Landscaping. For commercial residences, our team will schedule routine maintenance tasks to meet your needs, whether you want service weekly or monthly. If you're looking to maintain and regularly keep up with your trees and shrubbery, you'll be happy to know that we also provide tree removal services around Manhattan. Whether there's a large tree on your property that's increasingly creating a safety hazard or a small bush that doesn't fit into the beauty of your design, our team of professionals will come by and remove your tree efficiently and without causing damage. Hedge trimming, stump grinding and residential logging are all services we provide with our arborists. Manhattan properties are looked upon regularly by residents and tourists. Fortunately, keeping your lawn and garden beautiful is easy with the help of our landscaping crew. Contact us today to learn more or schedule your free quote for a service you need.